Join us in supporting the annual Blue Santa Christmas project which provides income eligible families with gifts to give to their children on Christmas morning. While the parents pick up the gifts, the children will enjoy Santa Claus, story time, and other special Christmas activities. Blue Santa is a partnership between the Boerne Police Department, BISD Angel Tree, Kendall County Sheriff's Office, Hill Country Family Services (HCFS), YMCA, Boerne Community Coalition, Boerne Library Foundation, and Rainbow Senior Center at Kronkosky Place. Volunteers are needed the week of December 10th at Hill Country Family Services to help organize donated Christmas gifts in preparation for the Blue Santa event. Volunteers are needed the week of December 10th to shop for specific Christmas gifts from wish lists using donated funds and/or gift cards. Sign up to be a "Gift Shopper" and HCFS will contact you with more details. Volunteers are needed on Friday, December 14th to help transport the gifts from HCFS to the Kronkosky Place. 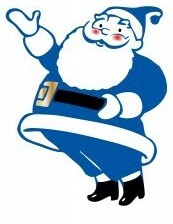 The Blue Santa event is being held Saturday, December 15th at Kronkosky Place. Volunteers are needed throughout the day to help with set-up, event activities, and clean-up.